I'm back with another Face of the Day. 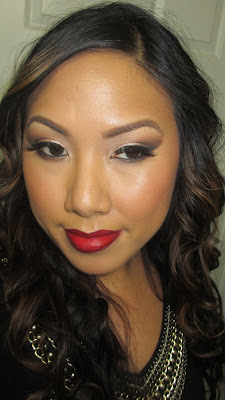 With it being the holidays and all, I decided to break out the perfect accessory - the classic, red lip! Here's a look that looks good on everyone - neutral, smokey eyes and red lips. I actually wore it for a graduation party with my class and it was a hit. Check it out! I wore a black sweater dress with metal details, so I could pretty much wear any makeup. However, I decided to go for a red lip. It was a little risky since I was attending a graduation dinner, but applied correctly, the red lip lasted all night long. 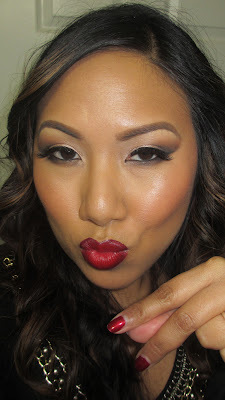 I used a drugstore lipstick and liner combination to achieve this look - every brand has a red in its collection. Use a darker liner to define the edges and a lip brush like the one I designed for the Sedona Lace Vortex collection to apply the product. Take your time because a red lip should be very neat! For the eyes, I decided to go with some neutral colors so that the lip could shine. But I still smoked it out a bit for fun. I mainly used some Ben Nye and Makeup Forever shadows that I have in a palette - a shimmery champagne on the lid, dark brown and black in the outer, a warm brown above the crease, and a matte eggshell on the browbone. To glam up the neutral eyes a bit more, I put on a pair of wispie falsies. From there, I did some quick curls with my clipless curling iron and was good to go. The lipstick lasted all night too! The key is to do a couple of layers of lipstick and blot in between - that way you create a stain. 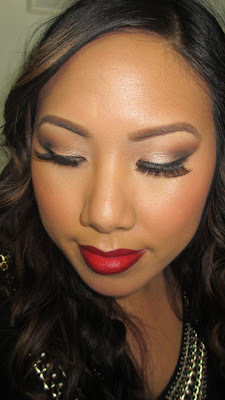 This is a great holiday look and most of you should have these colors in your collection. My classmates were surprised to see me with a full face of makeup since i'm usually lazy and makeup free in class lol. If you recreate this look send me pics and I'll feature you in a post! - I need this lip combo in my life... Do tell!